Word and music are inextricably linked for Ned Rorem. Time Magazine has called him “the world’s best composer of art songs,” yet his musical and literary ventures extend far beyond this specialized field. Rorem has composed three symphonies, four piano concertos and an array of other orchestral works, music for numerous combinations of chamber forces, six operas, choral works of every description, ballet and other theater music, and hundreds of songs and cycles. He is the author of fourteen books and of numerous articles. Rorem was born in Richmond, Indiana in 1923. As a child he moved to Chicago with his family. At seventeen he entered the Music School of Northwestern University; later, the Curtis Institute in Philadelphia, and Juilliard.In 1949, Rorem moved to France, to live there until 1958. His years as a young composer among the leading figures of the artistic and social milieu of post-war Europe are portrayed in The Paris Diary and The New York Diary. Ned Rorem has been the recipient of a Fulbright fellowship, a Guggenheim Fellowship, and an award from the National Institute of Arts and Letters. He received the ASCAP-Deems Taylor Award for his books and articles. His suite Air Music won the 1976 Pulitzer Prize in music. On his 75th birthday celebration in 1998, his evening-length song cycle for four singers and piano, Evidence of Things Not Seen, was premiered. Consisting of 36 songs, the three part cycle represents Rorem’s magnum opus in the medium. 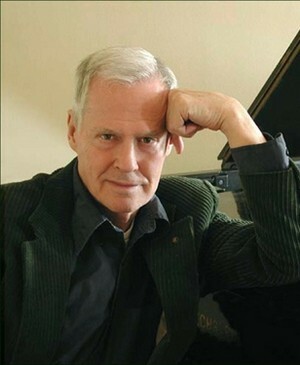 Ned Rorem composed “Six Variations for Two Pianos”, the commissioned work for the 5th Dranoff International Two Piano Competition. "Six Variations for Two Pianos"